A British booklover and multiple sclerosis (MS) sufferer who has set up a website-based organisation (Helen's Charity Auctions) to raise funds for MS research has just listed a fantastic auction item today that may be of great interest to crime fiction fans. 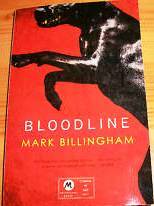 Mark Billingham, one of Britains top crime writers, has donated TWO signed galley editions of the upcoming US edition of his acclaimed recent Tom Thorne novel BLOODLINE. Galley editions are copies given to bookshops and reviewers - they are NOT available for sale. You won't be able to get your hands on these anywhere else. BLOODLINE was released in New Zealand, Australia and the UK in late 2009, and was one of only two books I gave a 5-star rating to amongst the dozens of crime fiction reviews I wrote for Good Reading magazine in 2009. It is a terrific book, from one of the very best contemporary crime writers. The US edition won't be released until July 2011. You will also not be able to buy this edition in shops in the UK. No matter where you are in the world, you can bid on the signed galley copies of BLOODLINE (and support a fantastic cause) here. The auction holder will ship internationally. All proceeds from the auction go to MS research, and it's a great opportunity to get your hands on a signed copy of a rare version of a great book. Multiple sclerosis is a condition of the central nervous system that can cause numbness, dizziness and balance issues, cognitive difficulties, severe fatigue, speech and swallowing difficulties, and bowel and bladder problems, amongst other symptoms. It is an autoimmune disease, which in effect means the body's immune system attacks itself. It is the most common disabling neurological disorder among young adults and affects over 2.5 million people worldwide. Women are around two to three times as likely as men to develop MS. Once diagnosed, MS stays with the person for life, but treatments and specialist care can help people to manage many symptoms well. Currently there is no cure. For those interested in bidding for this signed, rare version of a great book, and/or supporting a great cause, bid here. Craig - Thank you for passing the word along about this! That's a great, great idea!! Looks like a fantastic opportunity to support an excellent cause and get hold of a great book. Thanks for the heads up.